Aviyal is one of the traditional must have cooked dish for Sadya (traditional feast) of Kerala. Sadya without Aviyal will be like pickle without salt. 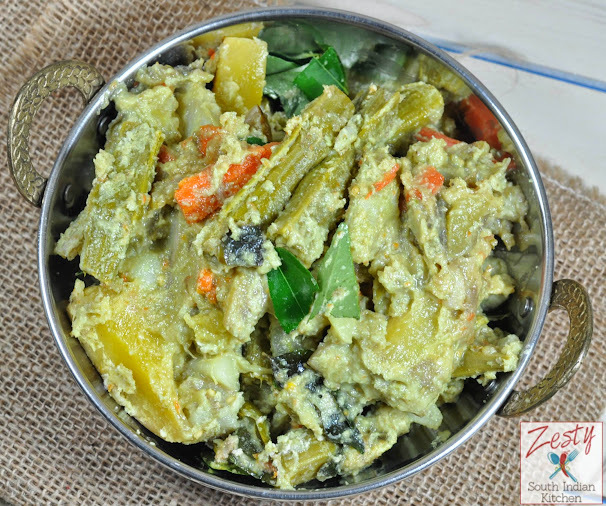 It is a medley of vegetables cooked in spicy coconut paste with some souring agent. Uniqueness of this dish is that it doesn’t contain any seasoning. Where as in other curries there will be seasoning and it should be prepared and added before removing the dish from fire. Like other Kerala cooking, it has also under the influence of regional difference, especially with souring agent used to cook Aviyal. In Thiruvanthapuram region usually tamarind or raw mango is used as souring agent, where in Thrissur curd is used as souring agent, in other parts curd or raw mango is used as souring agent. I have tried all of them each taste wonderful. I think this dish has some reference with Great Epic of Mahabharata . Story goes like this that during time of vanavasa (forced to stay in forest for 12 years) Pandavas are living in the dense forest of Kerala. Except Bhima all the other guys are happy with nuts and fruits what they get from the forest. While Bhima he loves food and also is a body builder, compared to other guys and desperately needed some solid food, so he gathered all the vegetables available in the forest and cooked them with turmeric and salt and added some ground coconut chili paste and while removing the dish from the fire added some coconut oil and curry leaves. Curry turned out dry but tasted awesome, Bhima was happy. People of Kerala continued the tradition of making it from then on. I don’t think there is any historical evidence to this story. I got this story from my Grandma. There is also another story regarding the origin of Aviyal and goes like this: During every year, there was a Vedic conference conducted in Travancore (Now Thiruvanthapuram) in a Kings Palace called Murajapam. Like the seminars of today, food and accommodation was also provided (Now you have to pay from your pocket while registering for a conference) that time it was provided. On the last day the chef found that there lot of vegetables waiting to be used, so he didn’t want to waste the vegetables and cooked up Aviyal. King got happy and presented him Gold bracelet and asked him to cook Aviyal for every coming Murajappam. I like both stories; still I am somewhat inclined towards Bhima’s story. I love grandma’s stories, since they were my bed time favorite. Traditionally Aviyal is cooked with Plantain (Ethakka), Elephant Yam(Chena/ Suran), Long string beans(Achinga Payaru), Snake gourd(padavalenga), Cucumber (Vellarikka), Drumsticks(Muringakka) , Egg plant (Brinjal), Raw Mango (Pacha maanga) and Carrots.In northern Kerala they even put Bitter Gourd (Paavakka). In some recipes of aviyal I have also seen garlic. Amma doesn’t add any garlic or bitter gourd so I like that version. There is no hard and fast rule that you can cook Aviyal with only certain vegetables but there was still some vegetables don’t go well in the aviyal such as tomato, ladies fingers, cabbage, cauliflower, beetroot (it stains the dish), radish, turnip, onion, sweet potato, etc. 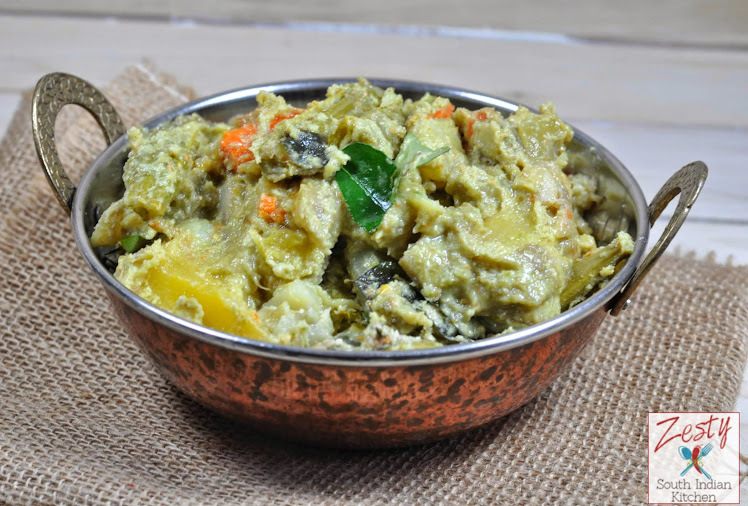 Since I was not able get Elephant yam, snake gourd and drumsticks here in US, I made aviyal with potato, beans, carrot, cucumber, eggplant etc. Cooked vegetables get coated with ground coconut chili paste and coconut oil making it awesome. If you get some time, try this vegetable medley sure, it will taste great even Bhima can enjoy it why you can’t just kidding. Here goes the recipe. Wash and peel the skin of banana, potato, carrot and cucumber and cut into 1 ½ -2 inches pieces and set aside. Cut the eggplant into 1 ½ -2 inch pieces and set aside. Extract juice from the tamarind by heating tamarind with 1/8 cup water for 15 seconds on microwave at high. Strain and set aside the juice. Cook the vegetables with turmeric and salt with 1 1/3 cup of water until it gets cooked well it takes about 25 minutes. Add tamarind juice to the vegetables and cook for another 2 minutes. In the mean time grind coconut with green chili and cumin seeds with ¼ cup of water. Add this ground paste to the cooked vegetables and cook for 1 minute. 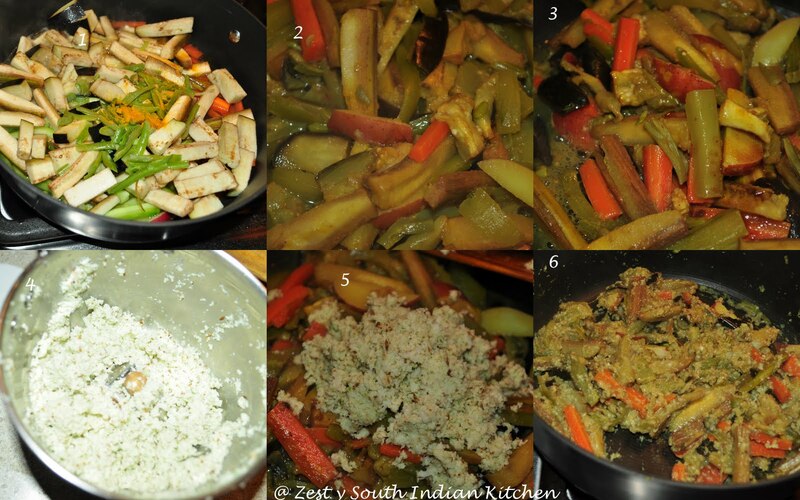 To this add curry leaves and coconut oil and mix again once again and switch off the flame. Enjoy with rice and sambar. 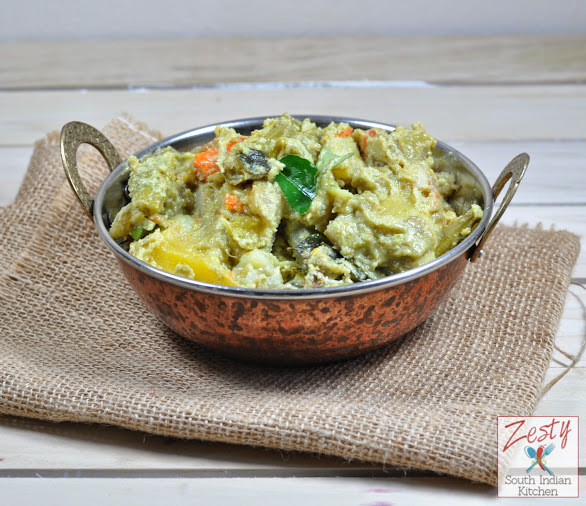 This looks like a wonderful home cooked dish..perfect with steaming rice & dal! I love the aviyal but today more than that I loved reading both the stories but liked the Bhima version more. Wat an authentic dish, looks yummy.. I love Avial a lot.yours look yummy. Very classic n authentic..looks delicious! What a great way to make veggies! Sounds really delicious with the flavor of coconut! nice to know few stories from you swathi..aviyal looks tasty and yummy!! Amazing avial..Perfect for adai’s..Loving it..
Iiiiiiiiii love it ..i can eat whole thing as a full meal.. my fav one.. Looks delicious dear. sadarana Aviyal enikishtamilla but this looks thakarpan. Its good to know the history of this unique dish. Every region has its own way of cooking. I really enjoyed reading the post. aviyal looks delicious!!! What a beautiful dish! I bet it was super tasty! I love all the vegetables! Thanks for being my first follower! I love Indian cuisine, so I look forward to making a recipe of yours in the near future. Thanks for sharing all these wonderful traditional recipes. This is another exciting recipe that I won’t have known if not because of your blog. my all time fav.. u have done it so perfectly..nice clicks too. Hi there….I will repeat the story to my kids…when they refuse avial..lovely clicks..I am going to make today…kothiyavunnu…. Love aviyal…looks yummy..loved both the stories..
Love aviyal.looks yummy..loved both the stories..
Swathi , enjoyed reading the story behind it. This coconut based dish sounds perfect to go with plain rice and dal. Nice stories. Aviyal looks so yummy..
great work..aviyal is looking yummy…. Haha thanks for sharing the story behind this dish! I love anything with coconut and it looks delicious! I’ve something for u in my blog… Check it out swathi dear..
who cud resist this recipe. love it.